MoldGel is a prosthetic grade alginate that mixes easily into a smooth, creamy consistency providing the finest in forensic detail, right down to the fingertips. MoldGel sets in 3 to 5 minutes. Its three-to-one water to MoldGel mix ratio makes this the right choice for larger applications such as torsos and faces. 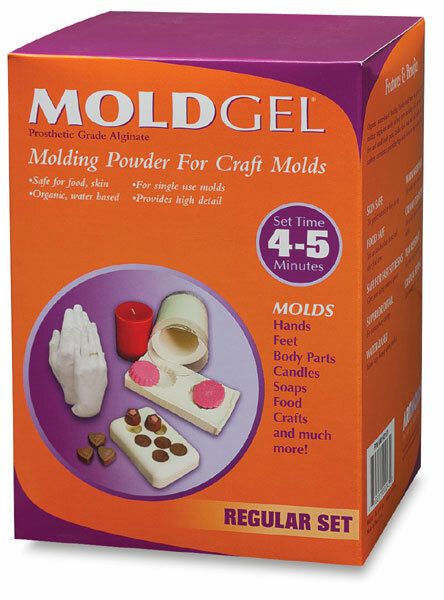 The 1 lb box will yield up to 4 pounds of molding gel alginate that is perfectly safe for skin and food applications. The 10 lb box yields 40 lbs, and the 20 lb box yields 80 lbs. ® ArtMolds is a registered trademark.® MoldGel is a registered trademark.